Where are ministers travelling for St Patrick's Day? Where are Government ministers travelling for St Patrick's Day? 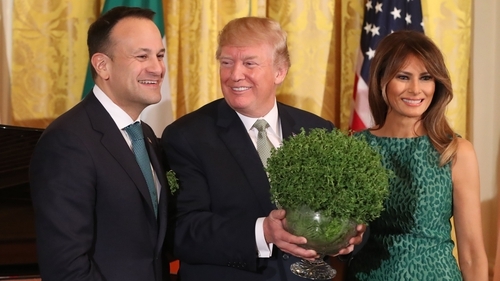 The Government has announced its St Patrick's Day programme for 2019, with the Taoiseach and his ministers travelling far and wide to represent the country abroad. Taoiseach Leo Varadkar will visit once again Washington DC, with a government minister visiting every EU capital. There will also be representation in the Middle East, the Americas, and the Asia Pacific region over the St Patrick's Day period, as the Government pushes its claims for a seat on the UN Security Council from 2021. The Department of Foreign Affairs said visits have been planned for Wellington, New Zealand, and Vancouver, Canada, where Ireland opened new diplomatic missions last year. Ministerial visits have also been planned for Colombia's capital Bogota, Santiago in Chile, Mumbai in India, and Los Angeles ahead of the opening of new Irish embassies and consulates in the cities this year. Who is going where this St Patrick's Day?